The classic, natural supremely resonant sound of Craviotto Mahogany complemented with 45 degree bearing edges. Payments as low as $22/mo. Or, apply & pay as little as $22/mo. This Craviotto custom mahogany snare drum is simple and warm. Mahogany snare drums have a distinctively dark, earthy tonal quality derived from the more porous, less dense wood that naturally filters the snare's high frequencies. The maple reinforcing rings are used as a way to help counterbalance the Mahogany's prominent lower overtones by stabilizing the shell, raising the pitch and increasing its projection without sacrificing its unique tonal tendencies. The classic tube lugs tune easily and hold tune easily as well. It also is equipped with the Trick throw-off, which has really become the industry standard for custom companies. 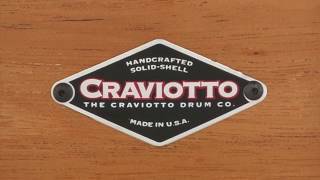 Since their inception in 1990, Craviotto drums have been considered some of the most sought-after instruments in the world. It is John Craviotto's master craftsmanship and commitment to quality that has set his work apart from all of the rest. Once you hit one of these incredible drums, you'll see why it's no wonder so many players go to Craviotto to find their sound. In this video, Sound Pure drums specialist Barry Knain explains the various features of the Craviotto 6.5x14 Mahogany Custom Shop snare, and tests it out in several different tuning ranges. The Custom Shop Snare Drums are the flagship drums of the Craviotto Drum Company, and consist of high performance, highly collectible Solid Shell snare drums. Available in Ash, Maple, Cherry, Poplar, Walnut or Mahogany (or any Stacked Solid combination thereof), with an optional Maple, Cherry or Walnut inlay, each Custom Shop Snare Drum features a hand-selected, handcrafted shell and gleaming chrome-plated hardware along with premium-quality components including Craviotto’s chrome over brass machined “Diamond” tube lugs, Remo Ambassador drumheads and Craviotto Deluxe Snare Wires. All drums come with a heavy-duty, padded Craviotto drum bag, and chrome Trick GS007 strainer. Options include a choice of heavy-gauge (2.3mm) triple-flanged Vintage style straight or diecast counterhoops and natural satin oil or high-gloss lacquer finish. Since 2004, Craviotto Drum Company has paved the way in offering custom built, handcrafted one-ply, solid shell drums. Our aim is to explain how solid shells perform differently from ply shell drums. Craviotto Drum Company builds concepts. We want to share these creations with you. We also want to promote our family of artists, and our family of dealers where you can purchase one for yourself. Each custom drum we make is handcrafted by our small group of artists and craftsmen in California. We don't source our shells like other manufacturers. We get our hands dirty. We start from scratch and see the process through all the way here in the USA. No shortcuts are taken, no compromises made. Our process starts when we send our craftsmen to the source. Johnny and our team literally pick through millions of board-feet of wood determining which boards are good enough to bear the Craviotto name. And that's just the starting point. From there, each drum goes through Johnny's proprietary process and passes through the six most talented sets of hands in the drum building business. Each shell wears Johnny's fingerprints, sweat, and final signature of approval with pride. Not every board makes it, only the best get Johnny's signature.